Residence Maeva Victoria Surf Biarritz, Hotel France. Limited Time Offer! Residence Maeva Victoria Surf. "Residence Maeva Victoria Surf" is an apart-hotel. 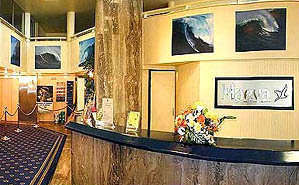 The accommodation has acquired 3 stars and it is situated in Biarritz. The accommodation can be reached easily from the airport. Don't forget to bring your swimsuit as this apart-hotel presents its visitors with an outdoor pool. By taking part in hunting you have the opportunity to make your stay a more active one. There are also numerous sporting activities for visitors, such as golf, surfing, horse riding, tennis, volleyball, sailing, waterskiing and diving. There is a walking trail, motorboats and boats as well as a bike rental service. "Residence Maeva Victoria Surf" welcomes you to the onsite casino. For those who like to share their experiences instantly, there is Internet access available free of charge.